The Blue Star Families of Central Virginia War Dogs project shows support for the most heroic, professional, and inspirational animals in the world: Military Working Dogs (MWD)! 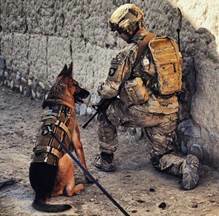 All the service branches use military working dogs. 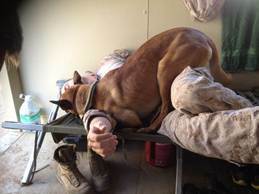 They are stationed around the world with their handlers in such places as Indonesia, Germany, Kuwait, Afghanistan, Iraq, Saudi Arabia, Africa, and other locations. They patrol bases, compounds, ammunition depots, and check points. They track the enemy, perform bomb detection and support combat operations. They guard and protect our military personnel with courage and loyalty. 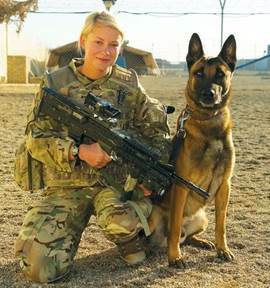 The War Dogs Project recognizes the importance of MWDs and their handlers to overall troop safety and morale by making them recipients of special CARE packages. 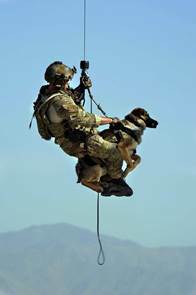 Our program has a positive impact on the morale of both the MWD handler, and the service members in their unit. In addition to standard CARE package items for the handler, the MWD gets items such as KONGS and other heavy-duty chew toys, firehose pull toys, Jolly Pet balls, Furminator and other grooming products, special dog soap/shampoo, collapsible dog water bowls, salves for paws and noses, K-9 toothpaste and brushes, and dog treats (made in the U.S.A. only.) When requested, we also include items such as Doggles, cooling mats, protective shoes, and muzzles. Visit Natural Pet Essentials, on their website or their Facebook page, and purchase items identified as War Dogs Project Approved. Your item(s) will automatically be included in the next Care package mailing.